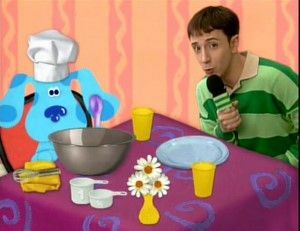 Blue's Clues is a colorful and learning series that is targeted at the younger crowd, but can be enjoyed by all. 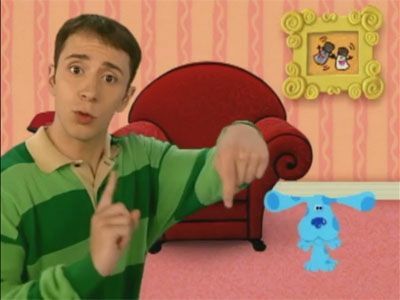 The host, Steve Burns, invites viewers daily into the Blue's Clues house to help him out, learn and have fun. 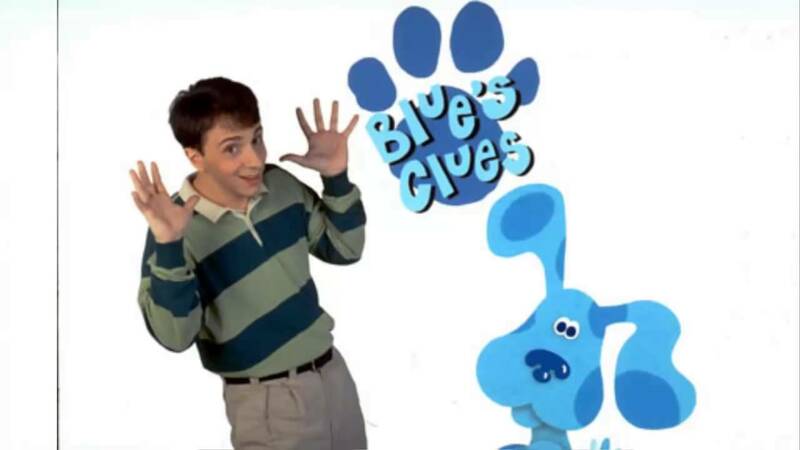 The show is based around the host looking for three clues that Blue provides by labelling them with a pawprint to figure something out and in the process, having an adventure. Steve and Blue are going on a nature walk, but before then, we try to figure out what the weather is going to be like. We learn about the weater, as Steve pretends to be a weather reporter and observes conditions outside. 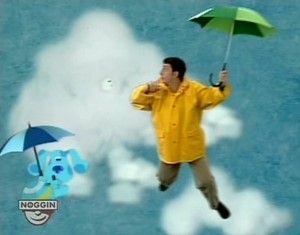 A Blue Skidoo segment takes us face-to-face with a drop of water. From it, we learn all about the water cycle, from beginning to end and over again. In this episode, we help the various characters to come up with words that rhyme with things they're saying. Rhymes are words that have the same ending sound as another word, such as ""say"" and ""hay"" or ""head"" and ""bed."" Lullabies usually rhyme and so we help Mr. Salt to create one to get Paprika and Cinnamon to sleep. We also skiddoo into a rhyming storybook. There we help out several characters whose stories aren't quite right because one of the things in them doesn't rhyme with the other two things. #3 - Animals in Our House? 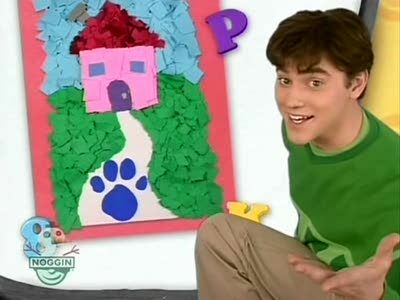 The animals from Blue's picture book, Animals, Animals, Animals are running loose in the Blue's Clues house. In this episode, we find them all, learning in the process what's special about them and how they make use of it in their natural habitats. We play a game of hide-and-seek with Shovel and Pail to find one animal and have some wacky fun with another. 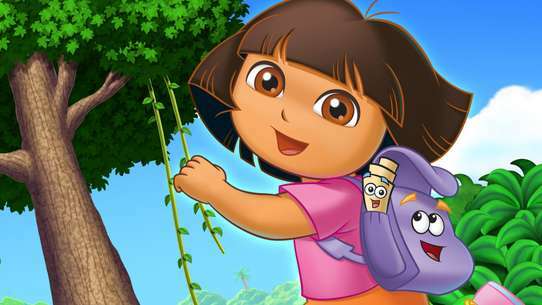 The animals could be anywhere, but they're not dangerous, so we have fun as we find them all. 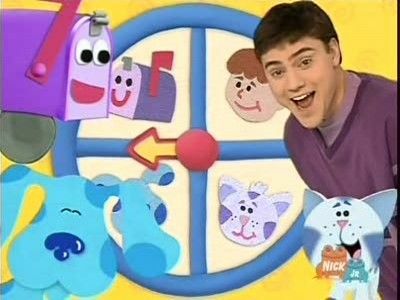 Coming into the Blue's Clues house, it's very early in the morning and so we follow the cahracters and learn about morning routines through song. We help Joe in figuring out what to do in the bathroom in the morning. We also help him with getting dressed. 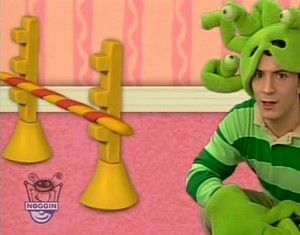 Later, a character called Shoehorn helps out with putting on his shoes. We also skiddoo into a shoe catalog for more work with shoe-tying. Blue figures out something to do today. #6 - Meet Polka Dots! 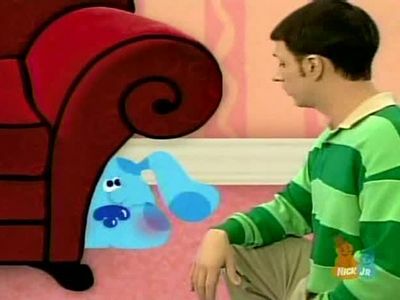 This episode introduces us to Polka Dots, a small, stuffed green dog-toy of Blue's with pink polka-dots. We also learn more about Joe's stuffed duck, Boris. We play pretend with Slippery, learning that using our imagination and perhaps our own stuffed friend, we can do anything we want to do. Then, we meet Periwinkle's friend, Mr. Plate and visit new places and situations with the two of them. In this episode, we explore all sorts of dances. We learn that all sorts of movements can qualify as a dance. In the Blue Skidoo segment, we find out that a person who works to create dances is called a choreographer. 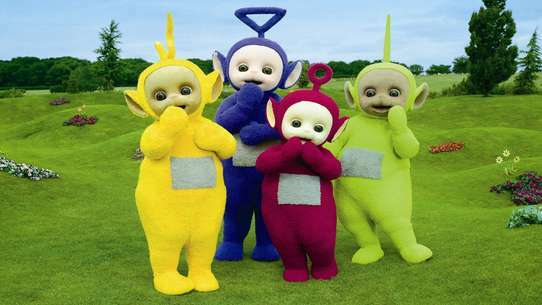 We help Steve and Blue to aid the choreographer in performing a new dance of his. When we correctly predict that when Blue pokes a soap bubble, it'll pop, we decide it would be fun to predict other things as well. In this episode, we use observations and logic to figure out things that will happen. We watch a robot race that Paprika sets up and use what she tells us about the robots to guess which will cross the finish line first. In the Blue Skidoo segment, we hop inside a storybook, where we predict what will happen in the story of Penguin Pierre, with the help of Bookmark to guide us along. 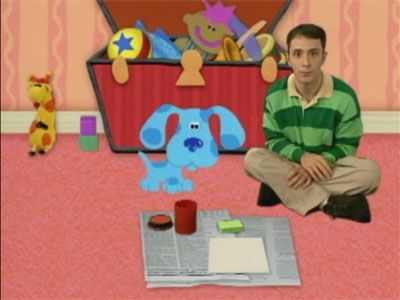 Magenta's owner, Miranda, comes over to the Blue's Clues house to return a book that she borrowed from Steve. She also has a video of Magenta that she wants to watch together with Steve and Blue later. Unfortunately, meeting new people can sometimes cause one to be shy. In this episode, we help some of our friends to feel less shy. We help Shovel to play with Pail's new friend, Sifter. Later, in the Blue Skiddoo segment, we help some of Blue's classmates at her school with some things that they're shy about. 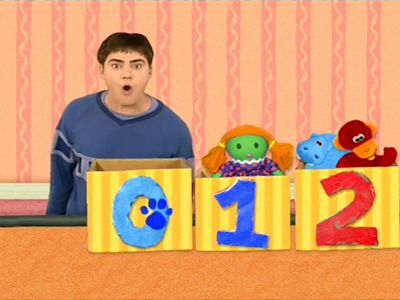 In this episode, we explore numbers, counting and basic arithmetic. We help out to find missing numbers by using counting to figure out where they're hiding. We also skiddoo into a book filled with numbers. There, we help out a couple of different numbers to tell a story and learn addition and subtraction in the process. At the top of the episode, Steve is playing show-and-tell. He's trying to figure out what he should show. He thinks maybe his stuffed toy, Horace the Anteater would be a good idea, or maybe his guitar. He gets a phone call and it turns out that it's from his brother, Joe. He's going to be coming over and is going to play show-and-tell with everyone. 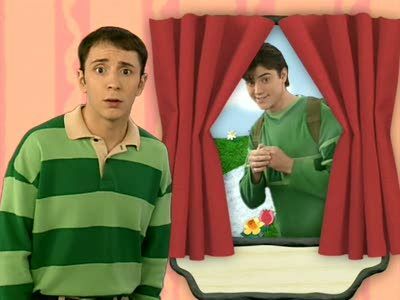 Throughout the episode, Steve plays show-and-tell with the various characters. He also spends time working on a picture to show to Joe and asks for the audiences' help. Finally, Steve has the viewers watch for Joe. He finally shows up and he and everyone else share their show-and-tell items together. 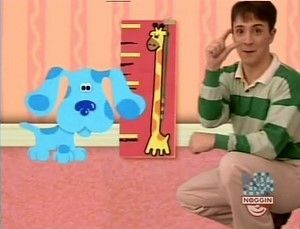 This episode features ""playdates,"" special time playing with some of the characters in the Blue's Clues house. We blow on the ""Wheel of Playdates,"" having fun Joe, Blue, Mailbox and Periwinkle (but not necessarily in that order!) In a special skidoo segment, Joe performs a musical number about our friendship with him. Later, viewers play pretend with Blue and her playroom friends in ""Blue's Room."" Today is Blue's Big Costume Party. 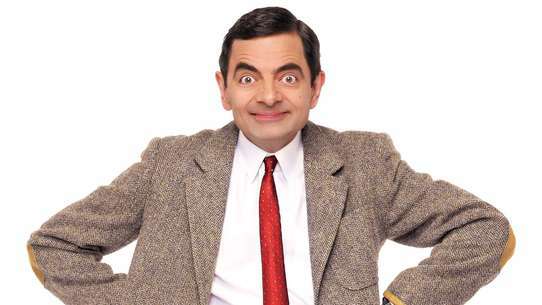 Everyone is dressed up in all sorts of interesting costumes, but who is dressed up as what? We use our observation skills to figure it out. We also skiddoo into a haunted house and search for the mysterious Oogulah Boogulah. Later, everybody does the costume limbo, finding out just how low they go while dressed up in their costumes. Blue has created ""Blue's Big Band"" and many of the characters, including Joe and ourselves will be playing instruments in the band. We practice with Tickety and later listen to some music that Mr. Salt, Mrs. Pepper and family are creating simply by using an old washboard. We follow along to some of Periwinkle's beats as he plays on the drums. Later, we skiddoo and meet Piano, who guides us through a musical story about a group of piggies. #15 - What Game Does Blue Want to Learn? Today, the characters check out some fun games. Steve tries his hand at juggling and also shows us a neat trick with the letter ""L."" We help out a felt friend to practice the game of tic-tac-toe. Later, we help Shovel, Pail and Blue to play following directions game called ""Mother May I."" #16 - The Lost Episode! 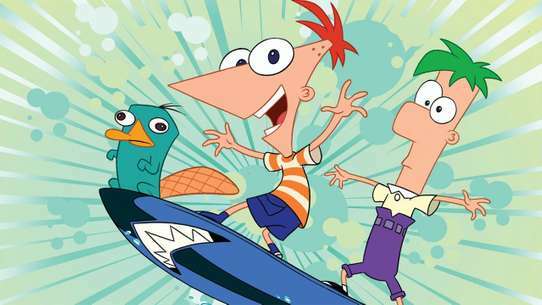 In this episode, the characters are dealing with trying to find things that they've lost. Sometimes it's not easy, but they have a little handy saying in the form of a song to help them, when you lose something --- ""go back, go back, go back to where you were!"" This helps out Steve to find something that he lost and later we help out Shovel and Pail and a kid named Felix after he loses some things when we help to walk him to school. 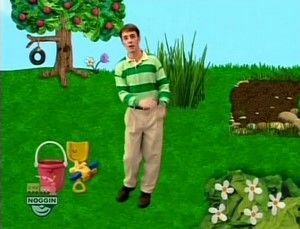 There's somebody building a fort in the backyard of the Blue's Clues house, but we have no idea who it is. In this episode, we put on our detective caps and logical-thinking skills. There's a mystery to be solved. Come along as we investigate, with a little help from Mr. Salt and all of our friends. 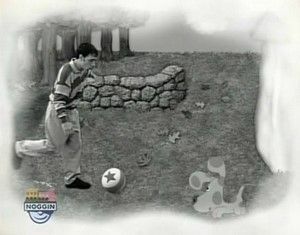 In this episode, the characters and us have a soccer practice and play Blue's Clues in a unique way. Joe is the coach and provides practical soccer tips about things such as how to avoid bumping into each other and not giving up. We also learn the importance of stretching and of sharing with our teammates. 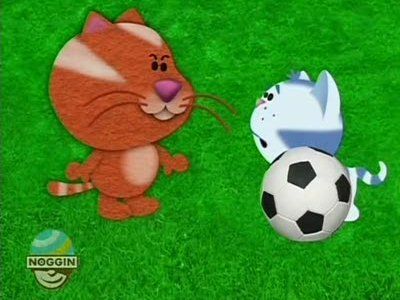 In ""Blue's Room,"" we talk about soccer and have some fun playing a game with Doodle Board. Joe has invented a brand new game called ""Presto Change-Joe"" and his idea is catching on with the other characters. In this episode, we have fun in taking part in new games, doing things like playing pretend and imitating behaviors. A game of Periwinkle's provides an opportunity for memorization. We also join in a game of Franny felt friend's in a Blue Skidoo segment and act out based on things that are lying around her room. Joe and Blue are expecting a surprise guest, so to get ready she and Joe clean Blue's room, with our help in putting things away in the proper places. We also help Blue put away her toys. 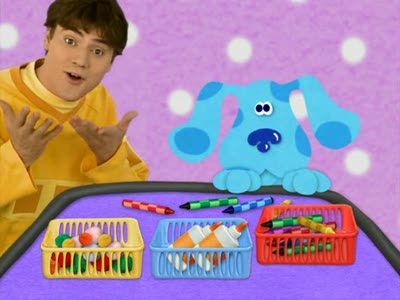 In the Blue Skidoo segment, we visit Blue's preschool and help Orange Kitten, Green Puppy and Duck put away the toys to get the preschool cleaned up. Back at the Blue's Clues house, we set up an apple juice party for the guest. The finding of a secret lost door gives us the opportunity to talk about things that are inside other things. For example, we play the ""Grocery Game"" with Mr. Salt and Mrs. Pepper. This involves placing various food items on shelves baased on what's inside them. We also get to skidoo into a pull-tab book, where we find many interesting things inside the tabs. #22 - I'm So Happy! 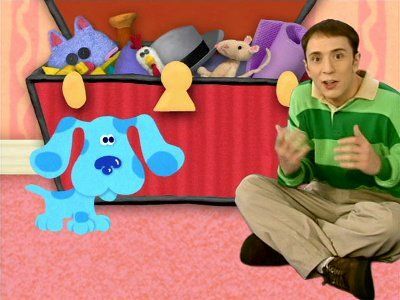 In this episode, we talk about what makes us happy and also find out what makes some of the Blue's Clues characters happy. Periwinkle likes magic, of course and Shovel has a favorite animal he likes to do impressions of. Joe's happy just to see us because we're so helpful. 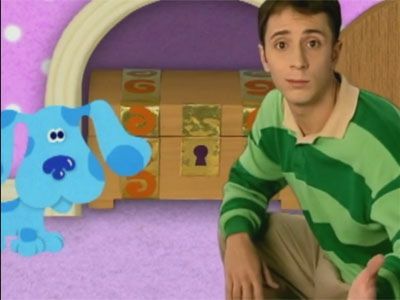 Unfortunately, sometimes we aren't always happy, as we find out in the Blue Skidoo segment. There, we find several characters that are having problems and help them to solve their problems so that they're happy again. 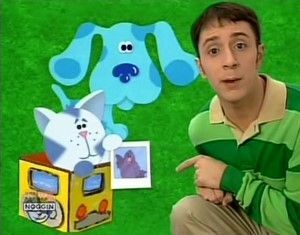 All of our friends are pretending to be different occupations, and we play Blue's Clues to figure out what Blue wants to be. We help Steve, who is pretending to be a reporter, figure out what occupation our various friends are pretending to be. Then we skidoo into a picture and help Door build his house by calling on the right workers to complete their appropriate tasks. 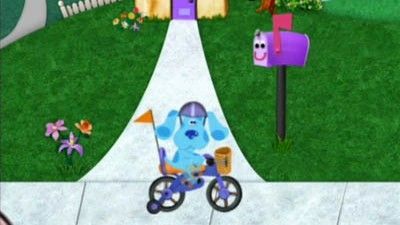 Periwinkle has recently moved into the Blue's Clues house from the city and very much misses his city bird friend, Periwinkle. We help to cheer him up and in the process learn all about the big city. 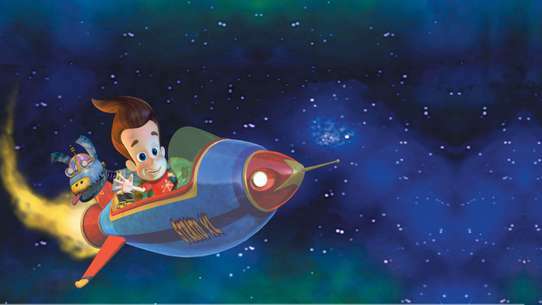 In the Blue Skiddoo segment, we find out about city things and also help out someone to find their friend. Also, when Periwinkle has trouble playing some of the games he always enjoyed at home, we help him to come up with some new twists on the old games. As we come in, Steve thinks that maybe we've grown some and it turns out that Blue's been growing too. As we focus on growing, we learn all about how plants grow. We also find out where they grow when we help some Felt Friends. In addition, an investigation with Shovel and Pail helps us to learn about length and volume.